Photosynthesis takes place in specialized membrane systems, made up of stacked disks linked together by unstacked planar leaflets. An LMU team has now identified a protein that tucks the membrane in at the edge of each stack. By making use of sunlight to generate molecular oxygen and other energy-rich chemical compounds that other organisms can utilize as nutrients, photosynthesis provides the basis for almost all life on Earth. Radiant energy from the Sun is captured by pigment-protein complexes embedded in specialized membrane systems called thylakoids. 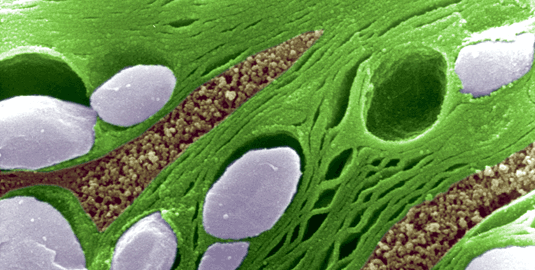 The thylakoids of green plants reside within organelles called chloroplasts, membrane-bounded compartments in the cell cytoplasm that serve as self-contained reaction vessels. Thylakoids are made of stacks of 5 to 20 flat membrane sacs called grana, and extended planar membrane sheets that serve to interconnect them, so that all thylakoids in a chloroplast form a continuous network. To form the stacks of appressed sacs, the membrane must be bent into a tight fold at their edges. This implies that the thylakoid membranes forming the grana stacks must somehow be induced to curve at regular intervals. “The origin of the stacked organization of the thylakoids and the local alterations in membrane curvature has been a complete mystery up to now,” says LMU biologist Professor Dario Leister. Leister and his group have now identified a new family of proteins, whose members spontaneously cause membranes to bend. The researchers call them CURT1 proteins (for CURvature of Thylakoids). “Without CURT1 proteins, there are no stacks,” Leister reports. Using the model plant Arabidopsis, he and his colleagues have been able to show that the concentration of CURT is directly correlated with the number of thylakoid stacks in chloroplasts. CURT1 itself is primarily localized at the edges of the grana, exactly where the membrane is maximally curved. In addition, the researchers have shown in the test-tube that isolated CURT1 molecules spontaneously assemble into larger complexes that can alter the curvature of membranes. “It is therefore likely that the aggregation of several CURT1 molecules plays an important role in the formation of thylakoid stacks in the chloroplasts,” Leister concludes. In the longer term, the new findings could contribute to the optimization of photosynthesis. The grana stacks in the thylakoids are enriched for the antennal proteins that gather and channel light energy and the reaction centers known as Photosystem II. They are therefore, in many respects, more efficient energy converters than the single-layered membrane sheets that connect them together, which harbor Photosystem I. Understanding how CURT1 functions might therefore allow one to increase the degree of stacking and enhance the efficiency of photosynthesis – and perhaps increase yields from crop plants. In cooperation with the Edmund Mach Foundation (Trento, Italy) and the University of Trento, the authors of the new study have applied for patent protection for the use of CURT1 in this setting. The study was carried out in the context of Collaborative Research Center SFB-TR 1 (Endosymbiosis: From Prokaryotes to Eukaryotic Organelles), and was financed by the DFG.